Slippery Surface Falls | Miami Premises Liability Lawyers Gerson & Schwartz, P.A. Contact Plantation, Florida Personal Injury Attorney Gerson & Schwartz, P.A. Slippery surfaces can be much more hazardous than we’d like to think. Indeed, slippery surfaces lead to dangerous slips and falls every day resulting in serious injuries. Depending on where the accident happens, she or he might have a slip and fall claim. What is a slip and fall accident? In short, it's a personal injury law term that refers to a situation where someone slips and falls on someone else’s property and gets injured as a result. This type of case falls under the broader legal category under premises liability law. Whether we’re at a retail store, a restaurant, or on private property, we never expect to encounter a dangerous slippery surface. However, when someone unknowingly walks across a wet area on a restaurant floor or steps across an icy patch on a sidewalk, they’re often prone to having an accident. If a slippery surface caused injuries to you or a loved one it’s important to contact an experienced injury attorney as soon as possible. You may be eligible for compensation. 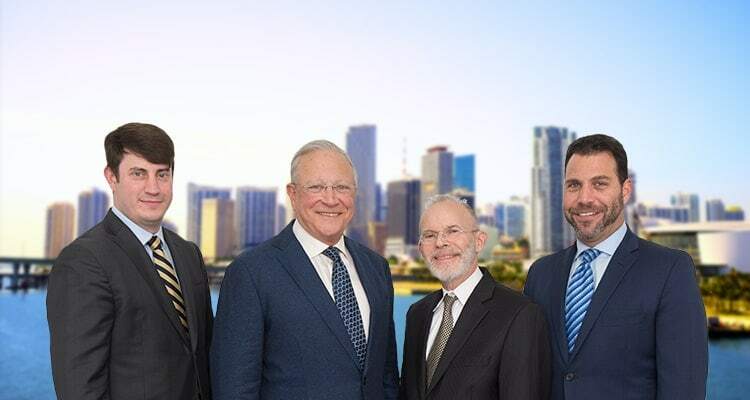 The experienced injury lawyers at Gerson & Schwartz know how to handle premises liability claims, and will make sure you’re compensated for your injuries. What are Wet or Slippery Surfaces? In general, wet or slippery surfaces are a primary reason that people slip and fall everyday. Slips occur when there’s not enough traction between a person’s shoe and the surface on which they’re walking. What kinds of surfaces cause slips? Often, wet surfaces lead to this type of accidents. For example, a recently clean floor might still be wet from the cleaning fluid, and it can cause dangerous accidents. In addition, spills can cause wet surfaces that can lead to severe injuries after an accident. The weather can also play a part. After a rain or snow storm, watery shoes and mud can create areas that are prime candidates for a slip and fall accident. Patches of ice also present serious hazards. At the same time, it’s important to know that surfaces don’t need to be wet in order to be slippery and dangerous. Many people suffer injuries from slips that occur on highly polished floors, such as tile or marble. These surfaces are often slippery even when they’re dry. Who is Responsible for Slippery Surfaces? When a slippery surface causes an accident, it’s a good idea to know who was at fault. If a slippery surface caused an accident at a business, it’s possible that the property owner, manager or business operator can be liable. At the same time, if the accident occurred on public property, such as at a local park, the victim might be able to collect damages from his or her state or local government. Both business owners and government entities have a duty to maintain their property and to make sure that it’s free of slippery surfaces that can cause dangerous accidents. They have to exercise reasonable care while maintaining the property, and they also have a duty to warn people if there’s a slippery surface that might a fall. This is a common law standard of care, but different states also have their own statutory laws concerning liability in a slip and fall case. In Florida, it’s more difficult for a government entity or business owner to be held liable, and heavier burdens of proof are placed upon the plaintiff. As a result, it’s important to have an experienced injury attorney on your side. Since Florida has more restrictive slip and fall laws than other states, the plaintiff often has more of an uphill battle than she might in other states. Specifically, under Florida Statute §768.0755, the plaintiff has to prove that a property owner (whether a business owner, a government entity, or otherwise) had actual or constructive knowledge about the dangerous condition that caused the slip and fall accident to occur. So what does a plaintiff need to prove in order to win a slip and fall case in Florida? The property owner owed a duty of care to the plaintiff. In other words, the property owner had a duty to exercise reasonable care in maintaining its property and also had a duty to warn about any potentially dangerous conditions or slippery surfaces. The property owner was negligent and failed to exercise reasonable care when she or he failed to maintain, inspect, repair, clean up, or warn about the dangerous condition that led to the slip and fall. The property owner had actual or constructive knowledge of the dangerous condition that caused the accident. In short, did the property owner know about the dangerous condition? Or was it at least foreseeable that an accident would occur because of a regularly occurring condition? The property owner’s negligence was the legal cause of the plaintiff’s injury. Place absorbent mats in entryways when there’s wet or inclement weather. You can avoid slippery surfaces before they happen. Use absorbent mats in areas that are prone to spills. For example, do you own a property where liquids are spilled on a routing basis, such as a kitchen? Keep absorbent mats handy for those situations. Display wet floor signs if you have a wet floor. It’s always a good idea to warn people about a potentially slippery surface. If you have tile or highly polished floors, place anti-skid adhesive tape in areas with substantial foot traffic. Take small steps and walk slowly—you’ll be less likely to slip and fall if you encounter a slippery surface. Always use handrails if they’re available. They can steady you if you walk across a slippery surface. Wear shoes with traction. For example, leather soles tend to be slippery on a lot of different surfaces. Have you been injured after falling on a slippery surface? It’s important to speak to an experienced premises liability attorney as soon as possible. The lawyers at Gerson & Schwartz know that slippery surfaces can cause severe injuries. They have extensive experience handling slip and fall cases, and they’ll walk you through the process of filing a claim. Contact us today to discuss your case.